Advice for writers: write about what you are afraid of. I’ve never been very good at that. In fact, when things have happened to me that nightmares are made of (hitting a pedestrian with my company car, getting adrenal cancer, to name a few) I can’t write. I won’t write. I avoid recording my thoughts and emotions, even just the facts. Maybe that’s why I took two memoir writing classes, to find a way to break through that wall. Yet I still have no desire to write about what I fear. Possibly that will develop as I grow as a writer. This week I read Laura Moriarty’s book, “The Rest of Her Life,” about a teenage girl who hits and kills a pedestrian in a crosswalk. I was interested in how another author would approach this topic, especially from the driver’s perspective. Moriarty focused more on the relationships among the family members and how they all dealt differently with the accident. I didn’t get what I wanted from the novel. But that’s what happens when you read a book, especially fiction. You get what the author wants to give you. Cancer. If I wanted to write about my experience with adrenal cancer I’d be competing with a multitude of other cancer books. I doubt if I have anything new to contribute. Even if I did, I still have no desire to write about it. I want to write about people who don’t exist. Whose lives I have made up and control. Whose lives do not resemble mine. In other words, books and stories I would want to read, characters I could engage with, who entertain me but don’t mimic me. I can’t engage with myself. Do other writers? Yet there is one story that I play a minor role in that both piques my interest and frightens me, the story of my German heritage through my mother. We have both Nazis and Jews for relatives; anyone who knew about the Jews is long gone. My mother, though Christian, lost two brothers during World War II. They got on a train and my mother’s family never saw them again. 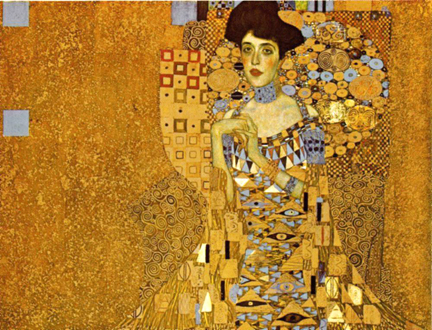 Watching the movie “Woman in Gold” this morning not only brought me to tears, it also resurrected my need to know more about the German history of my family. I must hurry—my mother is 87. This is a story I want to write although it has been written before. But this one would be for me. Posted on April 3, 2015, in Karen Whalen, writing and tagged "The Rest of Her Life", "Woman in Gold", Adrenal cancer, Germany, Jews, Laura Moriarty, Memoirs, Nazis, World War II. Bookmark the permalink. 8 Comments. Ah, this is what you meant, when you commented after my last posting, that one needs to write about what one is afraid of. You can do it, Karen. You’ll be writing for all of us. Thanks for the words of encouragement!! I’ll get busy on the books!! Confronting what we can’t, won’t, or don’t want to write about is crucial and you are brave for venturing forth. Hopefully we all can all help each other with this issue. As soon as the pre-order goes up on Amazon, I’ll reserve my copy. Wondering why this one is so much “for you”, when the other subjects aren’t? I really enjoyed this piece and also learning a little about you. I have two books in various pieces in my head and notebooks. maybe when i retire? I can only hope. your writing is wonderful and i would love to read your book(s) when finished!! thank you for posting!